Comfortably Sleeps 8, Large Sliding Glass Doors to Deck. Mile Marker 14. We would love to make your lake getaway memorable!! Relax and enjoy the beautiful miles wide view of the main channel from the screened deck. Our condo is 1400 square feet located at mile marker 14, off Horseshoe Bend Pkwy, is fully furnished and ready to be your home at the lake! There are 3 bedrooms, 2 full baths, all the comforts of home and more! There is a full size washer and dryer for your convenience. The Emerald Bay Condominium Complex features 2 salt water pools (seasonal), a tennis court, basketball court and a clubhouse w/fitness area for your use and enjoyment. Our Horseshoe Bend location puts you close to restaurants, shopping, golfing, and many other area attractions! Our condo is the perfect spot for your lake getaway. The floor plan is great for one or two families or a group of friends! With 3 bedrooms the condo comfortably sleeps 8. The kitchen has a full sized electric range, refrigerator, dishwasher and microwave, as well as all the dishes and cooking utensils you need. There is also a pantry to store plenty of groceries. We also have a Keurig and coffee maker for your use! Start your day with a cup of coffee while relaxing on the deck. The kitchen area has four bar stools and opens to the dining area with a table and four chairs. After a long day on the lake, sit back and watch the sunset from the spacious living room that features double sliding doors to the screened deck. We also have a large LCD TV, Blu-Ray player, selection of DVD’s, Sega gaming system and books for your enjoyment. The master suite has a king size bed, wall mounted flat screen TV, and double sliding doors to the screened deck. There are dressers for your use as well as a walk-in closet. The master bathroom has a double vanity and a tub/shower unit. Clean bedding and towels are provided for your convenience. This bedroom is a great place for kids! With a twin over full bunk bed and an additional twin trundle, this room is a great place for a sleepover! The room also has a wall mounted flat screen TV and plenty of closet space. Clean bedding is provided for your convenience. This bedroom features a queen size bed, wall mounted flat screen TV and closet. There is also a dresser and desk. Clean bedding is provided for your convenience. This full bathroom also has a double vanity and tub/shower unit. Clean towels are also provided for your convenience. We fell in love with the view from the screened deck! Enjoy the lake view with your morning coffee or evening drink from the screened deck! The view is spectacular no matter the time of day or season! The deck runs the length of the condo unit and has double sliding doors leading to the master bedroom and the living room so you can bring the outside in! A gas grill is also available for your use. Guests are welcome to use the Emerald Bay Facilities which include two salt water pools (seasonal), tennis court, basketball hoop, club house with seating, kitchen, fitness equipment and TVs. Our condo is across the parking lot from one of the pools and the tennis/basketball court. We fell in love with Lake of the Ozarks a couple of summers ago and can’t get enough! We have two young sons who love everything about the lake…swimming, boating, fishing, exploring, and more. No matter what the season or the weather, there is always something to do or see. We don’t currently live on Lake of the Ozarks, but that is our end goal! We spend as much time at the Lake as our busy schedules allow. It’s always great to get away from the hustle and bustle of everyday life, slow down and enjoy our family time! We looked at property after property and found the ones we loved the most had views of the Lake. We knew this was our condo from the unobstructed, miles wide Lake view alone!! We love watching the Lake in the morning while sipping coffee on the screened porch and can’t resist watching the sun set over an evening drink, while supper cooks on the grill. The view never gets old!! We also love that the condo is close to lots of shopping, food, and fun activities! The area has something for everyone! Have we mentioned the view?! And the sliding doors to the screened porch are fantastic! 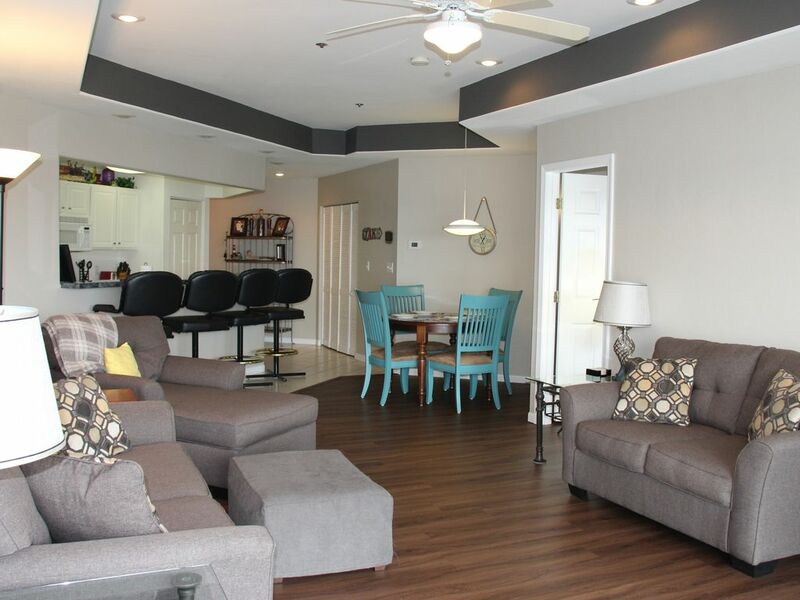 The condo is great for a single family or a couple of families looking to get away for a relaxing vacation or a group of friends reconnecting! Impressive miles wide view of the lake! Relax on the screened porch and watch the boats speed by! Strong Wifi signal around our condo allowing multiple devices connected at once. Regular coffee maker and Keurig machine available for your use. The kitchen has a full size electric range, refrigerator, dishwasher and microwave, as well as all the dishes and cooking utensils you may need. 4 chairs around dining table and 4 stools at the counter. 4 TVs (1 in each bedroom and 1 large screen in living room). Cable package provided. Living room has Smart TV with access to Netflix app. Screened in with amazing view! Tennis court directly across the parking lot. 2 salt water pools available for guests (seasonal). One of the pools is directly across the parking lot from our condo. This condo is a second floor unit, however; there is only one step to the front door once over the parking lot curb. Easily accessible! There are no stairs once inside the condo. GreaT Condo!!!!!! Brian was great to work with & we will definitely be back next year!!!!!! The condo was perfect for our mini vacation! The lake view was amazing and the three bedrooms accommodated our group so well. The condo is a short walk to the pool and close to a fabulous night life in the Ozarks. Would recommend this to anyone looking for a nice lake getaway. Loved the location and the condo! this condo exceeded our expectations. It was clean and comfortable. Loved the view and location! This place was beautiful!!! It was so comfortable and well taken care of. Experience the Lake Life and plan a vacation at your home away from home. Our vacation rental property is family owned and we want to share all the lake has to offer at Missouri's best kept secret, Lake of the Ozarks. Whether you're new to the Lake or are a regular visitor, there is always plenty to do. Enjoy boating, shopping, jet skis, fishing, dining, area attractions, golfing and nightlife. The lake is a great place to kick back and relax. Our condo is a great home station for all your activity planning. Stay with us and make lasting memories! The lake offers activities and events year round. Enjoy the hustle and bustle of Summer, the quiet beautiful Winter, or the changing of the season in Spring and Fall. -Enjoy your stay, live the Lake Life and have fun! -This is a family owned property, please provide us any feedback that can help improve your next stay anytime. -Some condo amenities may change as we are always looking to improve the property. If you have specific questions regarding photos or amenities, please contact us. -By booking with us, you agree the individual booking and paying for the stay is the same person that will be using the property and assumes all responsibility for damages or liabilities of friends, family and other guests. -Subleasing is not allowed without our express written approval. -Check in time is 4pm or later on start date. Check out time is 11am on last day of stay. -Pool is open from 8:00am-11:00pm (seasonal). The Clubhouse closes at midnight. -No Pets -Smoking allowed on screened deck only. (please be courteous and ensure doors are closed) -Night patrol personnel are contracted by the Association. -Do not leave personal effects on common elements, entry stairs, landings or outside condo door. -Trash must fit in a plastic bag and disposed of in provided dumpster outside of unit. Large items will result in a fine. -No gasoline containers, cans, or equipment can be stored on decks, inside units, or on walkways. -No glass or other breakables are allowed in either swimming pool area. -Fireworks and/or firearms are not allowed in the complex. -Do not throw landscape rocks or beach gravel. -It is the responsibility of each renter to tidy up after themselves when using the condo, club house, or pools. -2 Yellow hanging parking permits will be available for your use and must be displayed in your vehicle at all times. -Unreturned permits will result in a $150 fine (actual cost). Violators will be towed. -Parking permitted in striped parking spaces only. -Quiet hours are from 11:00pm - 8:00am, please be considerate of neighbors.